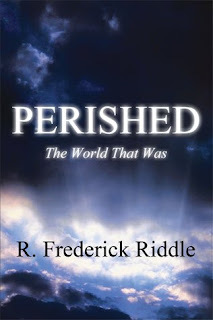 Perished is a midrash focusing on the first 6 chapters of Genesis: creation through the flood. Ever wonder what happened to Adam during the 900 + years he was alive after the fall? What about Cain after he kills Able? Seth? Riddle fleshes out many of the short references in the first parts of the Bible in a fantastical story that spans millennia. Overall, I loved this book. I have found myself drawn back to the first books of Genesis over and over again, and a lot of what Riddle has written, feels right: maybe not all of it, but a lot of it. There were quite a few typos and grammatical errors near the end of the book, but even I, a university English instructor, was able to overlook them for the sake of the story. One of the things that struck me in the book is that God is constantly calling the people to return to Him, but even though they can still see the cherubim guarding the Garden of Eden, they refuse Him. Even though the first created man is still alive telling them that God is the creator, they fashion other gods to worship. I actually felt tears welling up in several parts of the story that Riddle tells: when Adam is exiled, when Cain is cursed, when the flood comes. I hadn’t connected the humanity of the people affected in the Biblical accounts until seeing their lives fleshed out. Obviously Riddles accounts are just historical fiction and do not necessarily reflect what happened in those days, but I think the book does a great job making the reader think about the people involved in these biblical accounts as people and not just stock characters. If you enjoy fantasy novels, you’ll enjoy this fresh look at Genesis. I highly recommend it. Born in 1943, R. Frederick Riddle served in the U.S. Navy during the Vietnam War as a Radioman. He received Christ as his Saviour in 1973. He worked for Michigan Bell and later Ameritech (now AT&T) until 1993 when he retired. Riddle went to work for a Baptist Church as Financial Secretary until 2008 when he retired a second time and moved to Florida to care of his mother-in-law. He published his first novel in 2003 and his second in 2007. The novel, Perished, draws on both of those novels and much more research. He is currently working on a sequel to Perished. Visit the author via his website or Amazon page. Lucifer looked around in confusion. I was about to say something to Michael. Why did I stop? Suddenly his thoughts were interrupted. "Behold, I am God, the Beginning and the Ending, The Everlasting One. Out of nothing have I created you. I have designed each of you for a specific purpose, a certain service to perform. "Michael, thou wert created to lead My armies into battle and to guard the battle mounts of heaven. I have made thee an archangel and a Chief Prince. Under thee there shall be one third of all the angels able to wage war. “I have set thee as one of the three and thou shalt be mighty in all that thou shalt do. "Gabriel, thou art created to speak on My behalf. Thou shalt rule over all manner of communication. Your task is to ensure that My messages and commands are delivered to whomsoever I desire. To thee have I given another third of all the angels equipped to carry out your tasks. You also are an archangel and one of the three." I already knew that, Lucifer thought. "And Lucifer, to thee I have given great beauty. No creature shall have greater beauty than you possess. As an archangel, and one of the three, thou also shalt lead one third of the angels of heaven in singing My praises. You are over all manner of instruments of music and praise, which shall be to My glory! Lucifer looked at Michael and Gabriel, who didn't appear to be puzzled at all. But he found himself wondering: Why is the Holy Father telling us our duties. We have been doing them forever. And what is this about creation? "What does He mean He created us? We have been around for a long time." Pondering Lucifer's question, which he found intriguing, Michael thought back and couldn't remember a single time when he hadn't been an archangel. Looking around, he noted that everything looked as it always had looked. The walls, he thought, look the same. Each is built with glorious gemstones, one sitting upon the other in perfect symmetry. It is still as immense as ever! Is it possible that they were just created? And what about these mansions that have been tended regularly by countless angels for ages past? It is true they are empty, with no apparent purpose. But that has always been the case. And there are just as many mansions as ever. Everything is just as I remember. Even the gold pavement, with each tile perfect and beautiful, looks the same! "It appears that way," he replied. "Everything is as it always has been. I do not remember a thing different. But if the Holy Father says that He just created us it must be true. The Elohim is truth." "It does seem strange," agreed Gabriel. "But as Michael stated, the Elohim is truth and would not lie. Yet we all remember everything as being perfectly normal. "I do admit, however, that I cannot remember any specific event throughout eternity. I remember every structure of the City, but I cannot recall a single moment when any were erected. I should at least remember where the gems came from for the walls. But I do not. “I believe we have been created with complete memories enabling each of us to do our assigned tasks better. My job is to head up God’s communications and to see that His words are communicated to everyone. Yet I do not recall a single message that He has sent. The only way I can understand it is that I have been just created, as He said. “In addition, He has given each of us unique talents to accomplish our tasks. And He gave you great beauty, Lucifer. They are the Elohim and can do whatever They want!" "That sounds reasonable to me," Michael said. "That would explain how all this," he paused spreading his hands indicating the City, "is so familiar to me. God placed the memory of it in my mind." "You must be right, of course," Lucifer acknowledged. But inwardly he doubted. The three archangels broke up, each going his separate way. Lucifer could not remember what it was that he had been about to say to Michael. He shrugged and departed. "Behold as I, the God and Creator of all things great and small, create the earth out of nothing. I declare that there shall be seasons and times." All the angels watched as the Holy Father spoke and the window suddenly filled with a solitary, fiery mass. Lucifer and all the angels were rooted in astonishment. Immediately the dark planet was ablaze with light. Lucifer was mystified. Where is the light coming from? Suddenly he knew. The Holy Son is Himself the Source of light! Next, the Holy Son did an amazing thing dividing the light into night and day. Earth started rotating on its axis. Watching with all the angels, Lucifer immediately understood the planet would complete one rotation in 24 hours, which would be divided into minutes and seconds. This is the beginning of time. I must admit that the Holy Son has really created something interesting. Hmmm. It looks like these hours not only lead to days, but also the days lead to weeks and the weeks to months, each having 30 days. Curious, Lucifer studied the planet intently. Although impressed, Lucifer wasn't overwhelmed as he imagined such power to create was his as well. On Day Two the Holy Son spoke again: "Let there be a firmament in the midst of the waters, and let it divide the waters from the waters." Thus God divided the waters so that they were above and below what He called heaven. Lucifer nodded with sudden understanding. This heaven was the atmosphere. But why the water above the atmosphere? The answer would have to wait as the second day ended. On Day Three, the Holy Son said: "Let the waters under the heaven be gathered together unto one place and let the dry land appear." The angels watched in awe as God took the waters on the planet's surface and gathered them together into seas. For the first time, land rose from under the water. Amazingly the land was dry, except for rivers appearing here and there. Then something happened causing all of heaven to cry in sheer delight, impressing even Lucifer. The Holy Son created a living thing! Grass, herbs, trees, fruit, and vegetables came into being with the ability to reproduce after themselves. On Day Four the Holy Son created all the stars of heaven. But Lucifer noted, with surprise, the sudden existence of galaxies and solar systems populated with their own stars and planets. Amazingly each was created fully formed with the appearance of age and moving through space as though from an explosion! The sun was also created shedding its light upon the Earth and replacing the Son's light. He placed a moon in orbit around the Earth reflecting the sun's light during the night. Now Lucifer understood the purpose of the waters above the earth's atmosphere and surrounding the planet. It acts like a filter! And it shields the earth from the sun's rays. But why? Again his silent question went unanswered. On Day Five, God moved again. He created living creatures. Even as He spoke "Let the waters bring forth abundantly the moving creature that hath life, and fowl that may fly above the earth" there appeared all manner of aquatic life. Some of these were tiny fish while others were large whales, dolphins, sharks and gigantic sea creatures! The air was filled with birds, small and great, flying about with great abandon. "Be fruitful," God commanded, "and multiply, and fill the waters in the seas, and let fowl multiply in the earth." Lucifer shook his head in wonder. Not only was he impressed with God's demonstration of power, but he was also deeply disturbed. Why are the Elohim using their power to create a planet with such primitive life forms? Of what purpose can they serve? On Day Six, the Son culminated His work with two great acts of creation. First, He created all animals. "Let the earth bring forth the living creature after his kind, cattle, and creeping thing, and beast of the earth after his kind." Soon the dry land was populated with a variety of animals, some very small and others gigantic to the point of towering over some of the trees. As with aquatic life, each had the ability to reproduce itself after its own kind. But it was the creation of human life that stunned and troubled Lucifer the most. The Son said to God the Father and God the Spirit, "Let us make man in our image, after our likeness: and let them have dominion over the fish of the sea, and over the cattle, and over all the earth, and over every creeping thing that creepeth upon the earth." A hush permeated the heavens as God prepared the earth's soil and carefully, almost tenderly, formed the first man. All of heaven looked upon the still creature in awe. Lucifer had to admit that the Holy Son had done a masterful job. And he was impressed with the ingenious idea of the water surrounding the earth. He now realized that the filtering affect would also protect the humans. But it took all Three to accomplish these creative acts. I could have done the same without any help. Maybe I can do things God cannot do. And why create man when the angels of heaven are available to accomplish His will? In what possible way is mankind better equipped than the angels to rule over the Earth? Why does He regard man so tenderly? Taking the still creature, God breathed the breath of life into it and immediately its chest started rising and falling rhythmically. The angels erupted into choruses of praise. As the creature became conscious the coolness of the morning caused him to shiver. Opening his eyes, he looked up at God, Who smiled down at him. "I am Eloahh, your Creator. Thy name is Adam: for out of the earth were you taken. Arise and see what I have done." Deity! Recognition brightened Adam’s face. God extended His hand and pulled Adam upright. It was in that moment that Adam looked at his own body in wonder. Holding his hands outward, he noticed the slender fingers and how he could easily move them. His arms were thick and muscular while covered with very fine hair. Looking down, he took note of his chest tapering down to the belly, which was hard and flat. Like his arms, his legs were covered by fine hair, but there the likeness stopped. He had short, powerful legs that rested upon feet having five toes that were similar, yet different, to the five fingers of each hand. Again God spoke: "In six days I created the earth and the heavens and all that is in them. You have I created after My own image. I have loved you from before the beginning and shall love you always." A puzzled look crossed Lucifer’s face as he watched and listened to the scene below. As for Adam, he would later remember this event in great detail. "God lifted me up to where He was and I found myself looking upon the circle of Earth with the darkness of space behind it. I can still see the vast variety of blues that were the seas surrounding the land. And there were the browns, greens and a wonderful display of colors covering the ground. In the midst of it all was a large, dominating, barren place where nothing grew at all. But even in its starkness there was a strange, alluring beauty about it. It is a shame that no one will ever see what I saw that day. It was beautiful!" After showing Adam the earth as seen from outer space, God took Adam back to Earth and hovered above the barren plateau that he had seen. Looking down, Adam saw a vast land that was carpeted with full-grown trees, shrubs, plants and flowers. Scanning the forests he saw mountain ranges to the north and to the south. Momentarily his eyes rested on a mountain range to the southwest that pointed skyward like the fingers on his hands. It was the most majestic sight amongst so many grand sights. Even from the distance, he could see the varied shapes of the pinnacles. And the colors! Purples, browns, reds, oranges, and every color imaginable dotted these mountains. But the strangest sight was the barren ground below him, which stretched for miles in all directions. It struck Adam as being out of place in all the vast beauty. "Now behold! I create a special Garden for you." Before Adam's startled eyes, God covered the plateau with a thick blanket of rich soil hundreds of feet thick. He planted trees, bushes and every kind of vegetation imaginable before placing animals, a pair of every kind, within this beautiful Garden and transforming it into a magnificent paradise. It was the most beautiful place that he would ever know. Looking down, Adam watched in amazement and awe as the mountain he had earlier stood upon, collapsed forming a series of hills. Adam would later write of this moment: "Seen from above, the Garden was astounding, a sheer delight. I still remember the towering trees rising from the Garden’s fertile ground pointing towards heaven. “I think some of the trees were over two hundred feet high. From heaven looking down, it was like a roof. Not made of bricks, wood and mud as today's homes are made, but of leaves overlapping leaves. . It was so close and looked so firm that I felt like I could walk upon it. Far below, I later discovered that under that tree canopy there were areas of complete darkness, so dark that it was almost like night! "The garden is not a small grove or even a sheep range, but much larger. In the 40 days that Eve and I lived there, we never saw all that existed within its borders. "Hanging suspended in the sky and looking down, I could see its whole expanse. Circling the garden is a huge hedge, which I have touched. It is strong and impenetrable. I have since learned that on the opposite side are briars that can tear a man's skin. Whether they existed from the beginning, I do not know. I suspect that they are part of the curse. "Inside the garden is every tree imaginable, plus gorgeous flowers, plants and so much more. The sheer beauty of the place took my breath away! In most areas of the Garden were large flowering plants blending together to make a beautiful and colorful blanket covering the land. It is a tragedy that no one else will ever see it as I did. "But that is not what I remember most about my first sight of Eden. It was Eden River flowing from Lake Eden in the west to the Falls in the east. And Lake Eden was, and most likely still is, startling in its beauty. I knew right then that I wanted to see it up close, to experience it! "However, if you were to ask my wife, she would tell you her favorite remembrance is the Grove. This is where some of the most delicious fruits are found. The Grove is located just south of the river and stretches to the southern hedge. She and Serpent would explore this area every day it seemed. And she would return with new and exciting fruits, all of which she named. She would share these with me and later, in the cool of the evening, with God. It brought her great joy when God would taste of her discovery and praise her. "However, the Garden of Eden is more than a beautiful place with fine foods; it is where we walked with God. With tears I remember those precious times we spent with Him every morning and evening. Sometimes He would guide us to something He wanted us to see, but most of the time He would simply sit and talk with us. It is with great joy and bitter tears I remember the day when He created me and placed me within its borders!" This was a a FIRST Wild Card Tour book review! If you wish to join the FIRST blog alliance, just click the button. We are a group of reviewers who tour Christian books. A Wild Card post includes a brief bio of the author and a full chapter from each book toured. The reason it is called a FIRST Wild Card Tour is that you never know if the book will be fiction, non~fiction, for young, or for old...or for somewhere in between! I hope you enjoyed your free peek into the book! Thanks for a great article. You really give a good insight to the book. Thank you for making me aware of Riddle's book.